For a list of Governors-General and, before 1917, Governors of New Zealand, see List of Governors-General of New Zealand. 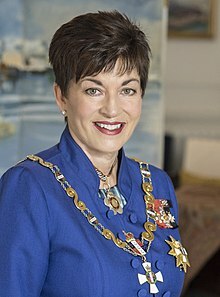 The Governor-General of New Zealand[n 1] (Māori: Te Kāwana Tianara o Aotearoa) is the viceregal representative of the monarch of New Zealand, currently Queen Elizabeth II. As the Queen is concurrently the monarch of 15 other Commonwealth realms, and lives in the United Kingdom (as her principal residence), she, on the advice of her Prime Minister of New Zealand, appoints a governor-general to carry out her constitutional and ceremonial duties within the Realm of New Zealand. The current office traces its origins to when the administration of New Zealand was placed under the Colony of New South Wales in 1839 and its governor was given jurisdiction over New Zealand. However, New Zealand would become its own colony the next year with its own governor. The modern "governor-general" and his or her functions came into being in 1917 and the office is currently mandated by letters patent issued in 1983, constituting "the Governor-General and Commander-in-Chief of the Realm of New Zealand". Constitutional functions of the governor-general include presiding over the Executive Council, appointing ministers and judges, granting Royal Assent to legislation, and summoning and dissolving parliament. These functions are generally exercised only according to the advice of an elected government. The governor-general also has an important ceremonial role: hosting events at Government House in Wellington, and travelling throughout New Zealand to open conferences, attend services and commemorations and generally provide encouragement to individuals and groups who are contributing to their communities. When travelling abroad, the governor-general is seen as the representative of New Zealand; for this reason, the governor-general is viewed by some as the de facto head of state. The governor-general (titled "governor" before 1917) initially represented the British monarch and the British Government. Therefore, many past officeholders were British, including a succession of minor aristocrats from the 1890s onwards. In a gradual process, culminating with the adoption of the Statute of Westminster in 1947, the governor-general has become the independent, personal representative of the New Zealand monarch. In 1972, Sir Denis Blundell became the first New Zealand resident to be appointed to the office. Governors-general are not appointed for a specific term, but are generally expected to serve for five years. The current Governor-General is Dame Patsy Reddy, who has served since 28 September 2016; Prime Minister John Key recommended her to succeed Sir Jerry Mateparae. Administrative support for the governor-general is provided by the Department of the Prime Minister and Cabinet. The New Zealand monarch appoints the governor-general by commission issued under the Seal of New Zealand. Constitutional convention adopted in 1930, following the Imperial Conference held that year, allowed for the appointment of the governor-general to be made upon the advice of the New Zealand Government, though that right was not exercised directly by a New Zealand prime minister until 1967, with the appointment of the first New Zealand-born Governor-General, Sir Arthur Espie Porritt on the advice of Keith Holyoake. The prime minister's advice has sometimes been the result of a decision by Cabinet; there is no requirement for this, and there have been a few instances where the governor-general was appointed with no consultation of Cabinet. Since 1980, the Department of the Prime Minister and Cabinet prepares a short list of candidates for the office. By convention, the leader of the Opposition is consulted on the appointment, however this has not always been the case. More recently, the introduction of MMP in 1996 and a multi-party system has meant the prime minister primarily consults with each of the party leaders in the House of Representatives. Sir Keith Holyoake, a former Prime Minister, was a controversial choice as Governor-General. On only one occasion has the prime minister's choice of appointee aroused public anger or complaint, and that controversy was short-lived. In 1977, Sir Keith Holyoake, a former National Party Prime Minister and a serving Minister of State, was controversially appointed as Governor-General. The Leader of the Opposition, Bill Rowling, complained he had not been consulted by Prime Minister Robert Muldoon on the appointment of Holyoake, and openly suggested that he would have recommended Sir Edmund Hillary instead. (Rowling's remark was in turn criticised by the Government, as Sir Edmund had backed the opposition Labour Party in 1975 as part of the "Citizens for Rowling" campaign.) It was suggested by many commentators that it would be inappropriate to entrust the office to a former party leader or anyone who is closely allied with a political party; however, despite his background, Holyoake could not be said to have discharged his duties in a partisan way, and he stayed in office for only three years. Since Holyoake's appointment, the prime minister has always confided with the leader of the Opposition during the nomination process, to avoid partisan controversy. Beginning with the appointment of Sir David Beattie in 1980, lawyers and judges have predominated as governors-general. Following the introduction of MMP, it has been determined that an understanding of constitutional law is an important prerequisite for candidacy to the office. There has been on-and-off speculation that a member of the Royal Family might take up the position. In 2004, National MP Richard Worth, an avowed monarchist, asked the Prime Minister, Helen Clark, whether she had considered nominating the Earl of Wessex to be the next governor-general. Before the governor-general enters office, his or her commission of appointment is publicly read in the presence of the Chief Justice of New Zealand (or any other High Court Judge) and the members of the Executive Council. He or she must take the Oath (or Affirmation) of Allegiance, and the Oath (or Affirmation) for the due execution of the office, which the chief justice or other High Court judge administers. From time to time, there have been proposals to elect the governor-general. When first drafted by then Governor George Grey, the New Zealand Constitution Act 1852 contained a provision for the governor to be elected by New Zealand's Parliament. This provision was removed from the final enactment, probably because the Colonial Office wanted to keep a check on New Zealand's colonial government. In 1887, Sir George Grey, by then also a former Premier, moved the Election of Governor Bill to make the office of governor an elective position. The Bill was narrowly defeated 46–48, being opposed by the government of Harry Atkinson. In 1889, Grey tried again with another bill, which if passed would have allowed for a "British subject" to be elected to the office of governor "precisely as an ordinary parliamentary election in each district." In 2006, political commentator Colin James suggested that the governor-general could be elected (or, more correctly, nominated to the Queen) by a 60% majority of votes cast in Parliament. James argued that the New Zealand public should be given the ability to choose the Queen's representative and that the current system is undemocratic and not transparent. Such a system is not unique: the governors-general of Papua New Guinea and the Solomon Islands are nominated in such a way. Constitutional law specialist Professor Noel Cox, who is a former chair of Monarchy New Zealand, criticised the proposal, claiming that "[g]iving the Governor-General a new and separate source of democratic legitimacy could result in a separation between Ministers and Governors-General. ...the Governors-General would have their own independent popular mandate, and become potential political rivals of the Ministers". In February 2008, the New Zealand Republic proposed electing the governor-general as an interim step to a republic, arguing "Electing the Governor-General allows for easier transition to a republic because the populace is used to electing someone as a ceremonial de facto head of state." With the introduction of the Governor-General Act 2010, Green MP Keith Locke suggested Parliament recommend the next governor-general's appointment to the Queen, with a recommendation endorsed by three-quarters of parliament. In its submission to the select committee considering the Bill, the Republican Movement suggested parliament appoint the next governor-general with a three-quarters majority plus a majority of party leaders in parliament, with a similar dismissal process and a fixed five-year term. National MP Nikki Kaye queried whether several one-member parties in parliament could veto the decision, which could give them too much power if an appointment was based on one vote per leader. The Republican Movement responded that the method would ensure appointments were made that most MPs and parties found acceptable. The governor-general holds office "at the monarch's pleasure", under clause II of the Letters Patent. It is the norm that an appointed individual holds office for a minimum of five years but this tenure may also be extended. For instance, Dame Silvia Cartwright would have been in office for five years on 4 April 2006, but her term as Governor-General was extended by four months as Prime Minister Helen Clark deemed that "the selection and appointment process [of a new governor-general] [should] not coincide with the pre-election period". A vacancy will occur on the resignation, death, incapacity or absence from New Zealand territory of the governor-general. In the absence of a governor-general the chief justice acts as the officer administrating the Government, referred to as "administrator" in everyday usage. Prior to the granting of responsible government in 1856, the colonial secretary acted as administrator when a governor was absent. The prime minister may advise the Queen to recall the governor-general. As no New Zealand governor-general has ever been dismissed on the advice of the prime minister, it is unclear how quickly the Queen would act on such advice. Some constitutional lawyers dispute whether the Queen would implement such advice at all, while others argue that the Queen would delay its implementation. Others argue that the Queen would be obliged to follow the prime minister's advice (so long as the prime minister has the confidence of the House of Representatives), and further that the Queen would be bound to implement the prime minister's advice immediately if so advised. Critics (such as supporters of a New Zealand republic) have described the ability of the prime minister to advise the Queen to recall the governor-general as a flaw in New Zealand's constitutional make up that gives the governor-general and the prime minister the ability to dismiss one another. They argue that this flaw is exacerbated by the reluctance of the monarch or their representatives to become politically involved. Three New Zealand governors have been recalled from office: William Hobson (who died before he was officially recalled), Robert FitzRoy and Sir George Grey. However, all three governed before the institution of responsible government in New Zealand; they were dismissed by the British Government. The governor-general's functions can be informally divided into three areas: constitutional, ceremonial and community. The Constitution Act 1986 provides that "the Governor-General appointed by the Sovereign is the Sovereign's representative in New Zealand". Most of the powers and authority of the New Zealand monarch have been delegated to the governor-general by the Letters Patent 1983. Further constitutional duties are outlined in the Constitution Act. The governor-general is empowered to exercise the Royal Prerogative (royal powers), including the reserve powers, on behalf of the sovereign. However, when she is present in New Zealand the Queen may exercise her powers personally. The governor-general is a nominal chief executive, acting within the constraints of constitutional convention and precedent. Although the governor-general's powers are in theory extensive, they are in practice very limited; most political power is exercised by the New Zealand Parliament (which is composed of the Governor-General-in-Parliament and the House of Representatives), through the prime minister and Cabinet. The governor-general does use a number of remaining powers, but almost always on the formal advice of the prime minister and other ministers. Ministers are, in turn, accountable to the democratically elected House of Representatives, and through it, to the people. (The governor-general may refuse to follow ministerial advice only in the event that the prime minister loses the confidence of the House of Representatives.) Even in the appointment of a prime minister, the governor-general rarely exercises any discretion; in accordance with unwritten constitutional conventions, the governor-general must appoint the individual most likely to maintain the support of the House of Representatives: this is usually the leader of the largest party among those forming the government. The governor-general appoints and dismisses Cabinet ministers and other ministers, but exercises such a function only on the prime minister's advice. Thus, in practice, the prime minister, and not the governor-general, exercises complete control over the composition of the Cabinet. The governor-general may, in theory, unilaterally dismiss a prime minister, but convention and precedent bar such an action. 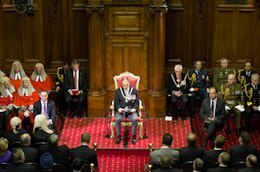 The governor-general presides over, but is not a member of, the Executive Council of New Zealand. The Executive Council (which comprises all ministers) exists and meets to give legal effect to decisions made by the Cabinet. The primary function of the Executive Council is to collectively and formally advise the governor-general to issue Orders in Council (to make, for example, regulations or appointments), which operate under the authority of "the Governor-General in Council". The governor-general also has custody of the Seal of New Zealand for all official instruments of "Her Majesty's Government in New Zealand". Before a bill can become law, the Royal Assent is required. 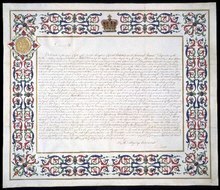 The governor-general acts on the monarch's behalf; in theory, he or she may grant the Royal Assent (making the bill law), or withhold the Royal Assent (vetoing the bill). By modern constitutional convention, however, the Royal Assent is invariably granted, and bills are never disallowed. The exercise of the above powers is a matter of continuing debate. Many constitutional commentators believe that the governor-general (or the sovereign) does not have the power to refuse Royal Assent to legislation — former law professor and Prime Minister Sir Geoffrey Palmer and Professor Matthew Palmer argue that any refusal of Royal Assent would cause a constitutional crisis. However, some constitutional lawyers, such as Professor Philip Joseph, believe the governor-general does retain the power to refuse Royal Assent to bills in exceptional circumstances, such as the abolition of democracy. The governor-general also exercises the Royal Prerogative of Mercy, an ancient right of convicted persons to seek a review of their case where they allege an injustice may have occurred. The prerogative of mercy can be exercised where a person claims to have been wrongly convicted or wrongly sentenced. The governor-general acts on the advice of the minister of justice. The governor-general has power to grant a pardon, to refer a person's case back to the court under section 406 of the Crimes Act 1961, and to reduce a person's sentence. If a person's case is referred back to the court, the court will consider the case in a similar way to hearing an appeal. The court then provides advice to the governor-general as to how to act. Recently, David Bain was granted such an appeal to the Court of Appeal, which in turn was appealed to the Privy Council. With most constitutional functions lent to Cabinet, the governor-general is particularly invested in a representative and ceremonial role. The extent and nature of that role has depended on the expectations of the time, the individual in office at the time, the wishes of the incumbent government, and the individual's reputation in the wider community. He or she will host the Queen or her family, as well as foreign royalty and heads of state, and will represent the Queen and country abroad on state visits to other nations. [n 4] Also as part of international relations, the governor-general issues the credentials of New Zealand ambassadors and consuls, as authorised by the Letters Patent. Increasingly, the governor-general is personally accorded the same respect and privileges of a head of state. This is particularity true when the governor-general visits other nations or receives heads of states. Under the Defence Act 1990 the governor-general is also the formal commander-in-chief of the Defence Force. The position technically involves issuing commands for New Zealand troops, though the governor-general normally acts on the advice of responsible ministers. In practice, commander-in-chief is a ceremonial role in which the governor-general will visit military bases in New Zealand and abroad to take part in military ceremonies, see troops off to and return from active duty, and encourage excellence and morale amongst the forces. The governor-general provides leadership in the community. Governors-general are always the patrons of many charitable, service, sporting and cultural organisations. The sponsorship or patronage of the governor-general signals that an organisation is worthy of wide support. This follows the tradition of royal patronage established by British monarchs; however, the practice of issuing warrants of appointment has been discontinued in New Zealand. Until the later 20th century, many governors-general were grand masters of the Freemasons, and they included visits to lodges as a part of their tours of the country. The governor-general has also had a long association with the Order of St John, traditionally serving as prior in New Zealand. Many of the governor-general's community functions also have a ceremonial dimension, such as attendance at the official openings of buildings, addresses to open conferences, or launching special events and appeals. The governor-general spends a large share of his or her working time attending state banquets and receptions, making and hosting state visits, meeting ceremonial groups, and awarding medals and decorations. As well as attending public events, the governor-general hosts many community functions at Government House. In a typical year, over 15,000 people will attend such events. Starting from New Year's Day 2009, the governor-general issues a New Year's Message to bring to attention issues New Zealanders might consider as they look to the future. The official vehicle of Government House in 2010, a Jaguar XJ8. During official travel it is the only vehicle in the country not required to use standard number plates. The New Zealand Government pays for the costs associated with the governor-general. Monarchy New Zealand states "[t]his figure is about one dollar per person per year", about $4.3 million per annum. An analysis by New Zealand Republic of the 2010 budget shows the office of governor-general costs New Zealand taxpayers about $7.6 million in ongoing costs and $11 million for Government House upgrades, a total of $18.6 million. These figures are disputed by Monarchy New Zealand, who claim New Zealand Republic "arbitrarily inflated the cost of the Governor-General". As of 2016[update], the annual salary is NZ$354,000, which is subject to income tax from 2010. Until the end of Sir Anand Satyanand's term, the salary of governor-general was regulated by the Civil List Act 1979. From the start of Sir Jerry Mateperae's term, the Governor-General Act 2010 applies. The governor-general's main residence is Government House, Wellington, and there is a small secondary northern residence, Government House, Auckland. Government House in Wellington closed in October 2008 for a major $44 million conservation and rebuilding project and was reopened in March 2011. In November 2012, Prince Charles opened a visitor centre at Government House in Wellington to mark the Diamond Jubilee of Elizabeth II. The viceregal household aids the governor-general in the execution of the royal constitutional and ceremonial duties and is managed by an official secretary to the governor-general. All of the governor-general's staff are public servants within the Department of the Prime Minister and Cabinet. Since the 1960s the New Zealand Government has supplied Government House with an official state car to transport the governor-general when he or she carries out official business. It is also used to transport other state officials, as well as visiting dignitaries, including royalty. The governor-general's official vehicle displays a representation of St Edward's Crown instead of standard number plates. The current official car is a BMW 7 Series. It replaced a Jaguar XJ8, which was purchased in 2003 for about NZ$160,000. The Jaguar was auctioned off in August 2011. 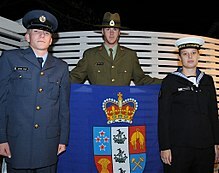 Military personnel holding the Governor-General's flag. This flag was first flown on 5 June 2008. The governor-general's flag may be flown from a vehicle in which the governor-general is travelling, or from a building in which the governor-general is present or is residing. The flag in its present form was adopted in 2008 and is a blue field with the shield of the New Zealand coat of arms surmounted by a crown in the centre. It takes precedence over the national flag. When the governor-general undertakes a state visit abroad, however, the national flag is generally employed to mark his or her presence. The national flag is also flown at half-mast upon the death of an incumbent or former governor-general. The design of the flag, with the shield and crown in the centre, mirrors the collar badge of the New Zealand Order of Merit which can only be worn by the Queen and the governor-general. A viceregal salute—composed of the first six bars of "God Save the Queen"—is used to greet the governor-general upon arrival at, and mark his or her departure from most official events. In the New Zealand order of precedence, the governor-general outranks all individuals except the sovereign. The governor-general and their spouse are styled "His/Her Excellency" during the term in office, and the governor-general is entitled to the style "The Right Honourable" for life upon assuming the office. From 2006, former living Governors-General were entitled to use the style "the Honourable", if they did not already hold the title or the higher appointment of Privy Counsellor. The incumbent Governor-General uses the titles of Chancellor and Principal Knight or Dame Grand Companion of the New Zealand Order of Merit and Principal Companion of the Queen's Service Order. The governor-general is entitled to a special court uniform, consisting of a dark navy wool double-breasted coatee with silver oak leaf and fern embroidery on the collar and cuffs trimmed with silver buttons embossed with the Royal Arms and with bullion edged epaulettes on the shoulders, dark navy trousers with a wide band of silver oak-leaf braid down the outside seam, silver sword belt with ceremonial sword, bicorne cocked hat with plume of ostrich feathers, black patent leather Wellington boots with spurs, etc., that is worn on ceremonial occasions. There is also a tropical version made of white tropical wool cut in a typical military fashion worn with a plumed helmet. This dress has fallen into disuse since the 1980s. Initially this was due to Sir Paul Reeves, as a cleric, choosing not wearing a military uniform. Although not specifically colonial, the traditional dress was abandoned as overt reminders of a colonial legacy. Usually the governor-general will now wear a black lounge jacket with morning dress trousers for men or formal day dress for ladies (or military uniform if they are already entitled to it) for ceremonial occasions and normal day dress at other times. The undress form of the uniform is still worn on rare occasions, such as when the governor-general visits military bases. From 1832 James Busby was assigned the post of British Resident in New Zealand. He played a role in drafting the Treaty of Waitangi, which established British colonial rule over New Zealand. Captain William Hobson was first appointed Lieutenant-Governor of New Zealand by letters patent on 24 November 1840 (having previously been the British Consul to New Zealand), when New Zealand was part of the colony of New South Wales. While Hobson is usually considered the first Governor of New Zealand, Sir George Gipps was the first governor over New Zealand, albeit only in his capacity as Governor of New South Wales, until New Zealand was established as a separate colony on 3 May 1841. Hobson continued in office until his death on 10 September 1842. 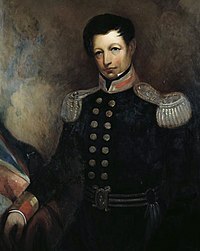 In Hobson's place the Colonial Office appointed Captain Robert FitzRoy. FitzRoy struggled to keep order between Māori and settlers keen to buy their land, with very limited financial and military resources at his disposal. His conflicts with the New Zealand Company settlements over land deals lead to his recall in 1845. FitzRoy's replacement, Sir George Grey, is considered by some historians, such as Michael King, to be the most important and influential Governor of New Zealand. Grey was the last Governor of New Zealand to act without reference to parliament. During his first term (1845–1852), Grey petitioned the British Parliament to largely suspend the complex New Zealand Constitution Act 1846 (Grey briefly took the title "Governor-in-Chief" under the Act but this was eventually reverted to Governor), drafting his own constitution bill, which became the New Zealand Constitution Act 1852. Grey's first term ended before responsible government was implemented. The task of overseeing the transition to responsible government was left to the Administrator of the Government, Robert Wynyard, who opened the 1st New Zealand Parliament on 24 May 1854. Wynyard was quickly confronted by the demands from members of parliament for the ability to select ministers from among their number—rather than the governor deciding. The parliament passed a resolution to that effect on 2 June. Wynyard and the Executive Council of New Zealand refused to allow this, stating that the Colonial Office made no mention of responsible government in its dispatches. Wynyard then offered to add some elected members of parliament to the Executive Council, which he did—a compromise that worked for a few weeks, until on 1 August 1854, parliament again demanded complete power to appoint ministers. Wynyard refused, and prorogued parliament for two weeks. Then on 31 August he appointed more elected members to the Executive Council, but when parliament met again on 8 August 1855, it moved a motion of no confidence in the members. Fortunately for Wynyard the next Governor, Sir Thomas Gore Browne, arrived on 6 September 1855. Gore Browne's tenure saw the introduction of responsible government, which contained the powers of the governor. In the following years, Gore Browne and Premier Edward Stafford clashed over whether the governor (and hence the imperial government) had control over Māori affairs, a key issue at the time. Stafford began the practice of Cabinet meeting independently of the Executive Council, further reducing the influence of the governor. Sir George Grey returned to New Zealand in 1861 for a second term. Grey struggled to meet the competing demands of the Colonial and British governments. The New Zealand Wars had brought many British troops to New Zealand, and fearing further fighting Grey, with the support of Edward Stafford, evaded Colonial Office instructions to finalise their return to Britain. In the end the Colonial Office recalled Grey in February 1868. After Grey, successive governors of New Zealand were derived from the British aristocracy and played a much less active role in government. In only a few instances did the governor refuse the advice of the premier—ironically mainly during the tenure of Sir George Grey as Premier from 1877 to 1879. One famous instance of the use of the governor's powers came during the term of Sir Arthur Gordon. Sir Arthur had left New Zealand on 13 September 1881 for a visit to the Pacific Islands. In his absence, Premier John Hall advised Chief Justice James Prendergast, acting as the Administrator of the Government (Prendergast was well known for his negative opinions about Māori from his decision in the case Wi Parata v the Bishop of Wellington), to order the invasion of the Māori pacifist Te Whiti o Rongomai's village at Parihaka, something the Governor had indicated he was opposed to. In 1907 Sir Joseph Ward's Liberal government passed a resolution to create New Zealand as the Dominion of New Zealand. This led to new letters patent being issued in 1917, which greatly curtailed the powers of the governor. To reflect these changes, the office was renamed governor-general (equivalent to governors-general of other Commonwealth realms), with the Earl of Liverpool, the serving Governor, becoming the first to be titled Governor-General. In 1926, following the King-Byng affair in Canada, an Imperial Conference approved the Balfour Declaration, which defined a British Commonwealth as a freely associated grouping known as the Commonwealth of Nations. The Declaration was ratified by the British (Imperial) Parliament with the Statute of Westminster in 1931. The effect of the Declaration was to elevate the governor-general from a representative of the British Government to a regal position with all the theoretical constitutional powers of the sovereign. New Zealand did not ratify the Statute of Westminster until after the Second World War however, with the Statute of Westminster Adoption Act 1947 being passed on 25 November 1947. Despite adopting the statute later than most other Commonwealth realms, the functions of the governor-general in representing the British Government were gradually reduced prior to the statute passing. For example, beginning in 1939, the British High Commissioner to New Zealand replaced the Governor-General as the foremost diplomatic representative of the British Government in New Zealand. In 1945, New Zealand Prime Minister Peter Fraser suggested that Sir Bernard Freyberg, the British-born commander of New Zealand's armed forces, be appointed Governor-General. Until 1967, the precedent was that governors-general were nominated by the British Foreign Office in consultation with the New Zealand prime minister, who then recommended appointments to the sovereign. In 1967 the first New Zealand-born Governor-General, Sir Arthur Porritt (later Lord Porritt), was appointed to the office, on the advice of the New Zealand Prime Minister, Sir Keith Holyoake. Porritt's appointment was followed by Sir Denis Blundell in 1972, who was the first fully New Zealand-resident Governor-General. In 1983, letters patent were issued once again, further reducing the powers of the office. The new letters patent were counter-signed by the New Zealand Prime Minister, symbolising the "patriation" of the office. Following the 1984 constitutional crisis, the 1852 Constitution Act was replaced by the Constitution Act 1986 and the governor-general's powers further limited. For example, section 16 of the 1986 Act significantly narrowed section 56 of the 1852 Act so that the governor-general has much less discretion to refuse Royal Assent to bills of parliament. With the patriation of the office came an expectation that the officeholders would be representative of New Zealanders generally; since then a more diverse group of governors-general have been appointed. 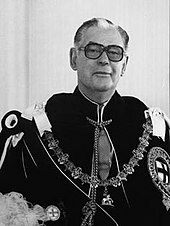 Former Anglican Archbishop of New Zealand Sir Paul Reeves (1985–90) was the first Māori Governor-General. Dame Catherine Tizard (1990–96) was the first woman to be appointed to the office. Sir Anand Satyanand (2006–11) was the first Governor-General of Indian and Pacific Islander origin, and the first Roman Catholic to hold the office. Increasingly, the governor-general is regarded as a de facto head of state. Political commentator Colin James has expressed this view, along with historian Gavin McLean and former Prime Minister Helen Clark. The governor-general has been performing more and more of the functions of a head of state, such as travelling overseas, representing all New Zealanders at major international events and generally promoting New Zealand interests abroad. For example, at the 2007 commemorations of the Battle of Passchendaele, Governor-General Anand Satyanand represented New Zealand on behalf of the Queen, while the Queen herself represented the United Kingdom. Reform of the office is usually only mentioned in the context of a New Zealand republic. Helen Clark, when defending Dame Silvia Cartwright following a political controversy over prison sentences, stated "[o]ne of the challenges for us is we clearly are no longer a dominion of Britain where the Governor-General is exactly like the Queen. I think we need to consider how the role of Governor-General might evolve further. As you know, my view is that one day there will be a president fulfilling the kind of role the Governor-General does." Others, such as Professor Noel Cox have argued that the governor-general's role needs to be updated, rather than reforming the office. Some constitutional academics expressed concern that the process of electoral reform could result in the governor-general having greater political influence.[why?] In 1993, the then Governor-General Dame Catherine Tizard caused controversy by suggesting that under the proposed mixed-member proportional (MMP) electoral system, the governor-general may have to use their reserve powers more often. Following the adoption of MMP at a referendum later in 1993, Prime Minister Jim Bolger suggested at the opening of parliament in 1994 that one reason New Zealand might move to a republic was that the governor-general would have more influence under the new electoral system. In December 2009 a review of the Civil List Act 1979 by the Law Commission recommended that part 1 of the Act be repealed, and replaced with a new Governor-General Bill to reflect the nature of the modern office of governor-general. The most significant change would be that the governor-general was no longer exempt from paying income tax on their salary. The changes proposed in the report would take effect for the appointment and term of the next Governor-General. The Bill was introduced into the House of Representatives on 28 June 2010 and was granted Royal Assent on 22 November 2010. ^ The Government of New Zealand spells the title "governor-general" with a hyphen, unlike the spelling in Canada, for instance. As governor is the noun in the title, it is pluralised; thus, "governors-general", rather than "governor-generals". Moreover, both terms are capitalised when used in the formal title preceding an incumbent's name. ^ The governor-general issues a writ giving permission for an election to be held. Following the election, the writ is returned to the Clerk of the House of Representatives with the names of all successful candidates who have been elected to electorate seats. ^ See the advice of the Chief Justice, Sir Robert Stout to the Governor-General, Viscount Jellicoe, in 1923, that "unless the Governor-General was satisfied that a stable Government could be formed as [an] alternative to the present Government it would be proper to grant a dissolution if requested by the Prime Minister"
^ Before a 2006 reform the governor-general had to ask the monarch's permission, via the prime minister, before leaving New Zealand. ^ "Governor-General (Salary) Determination 2016". legislation.govt.nz. Parliamentary Counsel Office. 2016. Retrieved 1 June 2017. ^ "Governor-General". New Zealand Government. 31 October 2016. Retrieved 28 October 2018. ^ "The Governor General". Government of Canada. 24 October 2018. Retrieved 28 October 2018. ^ a b c McLean, Gavin (28 September 2016). "Governors and governors-general". Te Ara: The Encyclopedia of New Zealand. Retrieved 29 June 2017. ^ a b McLean 2006, p. 17. ^ a b James, Colin (22 August 2006). "The huge challenge ahead of the Maori Queen's successor". New Zealand Herald. Archived from the original on 6 February 2012. ^ a b c "Republic 'inevitable' – Clark". The Evening Post. 4 March 2002. ^ "Announcement of Honours for Dame Patsy Reddy". Retrieved 14 September 2016. ^ a b c "Roles of the Governor-General". Government House: Governor-General of New Zealand. Retrieved 1 July 2017. ^ a b Joseph 2014, p. 140. ^ a b McLean 2006, p. 277. ^ Working with David: inside the Lange cabinet by Michael Bassett. Auckland, New Zealand: Hodder Moa. 2008. ISBN 978-1-86971-094-1. Archived from the original on 11 February 2010. ^ a b c Boyce, Peter John (2008). The Queen's Other Realms: The Crown and Its Legacy in Australia, Canada and New Zealand. Federation Press. pp. 175–176. ISBN 9781862877009. ^ a b c Cox 2001, pp. 10–11. ^ Cox 2001, p. 10. ^ a b G.A. Wood (2000). "Holyoake, Keith Jacka". Dictionary of New Zealand Biography. ^ a b c "Patriated". Ministry for Culture and Heritage. Retrieved 12 May 2018. ^ "Sir Geoffrey popular choice for governor-general – poll". New Zealand Herald. 26 November 2004. ^ "New Bills". XLIX (4594). The Timaru Herald. 18 July 1889: 3. Retrieved 8 February 2011. ^ James, Colin (17 January 2006). "Election: the democratic way to select our Governor-general". The New Zealand Herald. Archived from the original on 22 July 2006. ^ a b Cox, Noel (8 February 2006). "Governor-general role needs an update". The New Zealand Herald. Archived from the original on 22 October 2009. ^ Vance, Andrea. "New bill doubles governor-general's severance". The Dominion Post. ^ a b NZPA (18 August 2010). "Call for 75% support from Parliament for new GGs". Otago Daily Times. Retrieved 18 August 2010. ^ New Zealand Government (31 January 2005). "Governor General's term extended". Scoop.co.nz. ^ "Administrator of the Government". Governor-General of New Zealand. Retrieved 3 September 2017. ^ See, for instance, Willoughby Shortland, "sometime acting Governor of New Zealand". ^ a b Stockley, Andrew (1996). "Becoming a republic? Issues of Law". In Luke Trainor. Republicanism in New Zealand. Dunmore Press. ^ a b Simpson, K.A. (1990). "Hobson, William". Dictionary of New Zealand Biography. ^ Wards, Ian (1990). "FitzRoy, Robert". Dictionary of New Zealand Biography. Retrieved 16 February 2018. ^ Sinclair, Keith (1990). "Grey, George". Dictionary of New Zealand Biography. Retrieved 16 February 2018. ^ a b c d e f McLean, Gavin. "Governors and governors-general – Constitutional duties". Te Ara: The Encyclopedia of New Zealand. Retrieved 15 May 2018. ^ a b c d e f "Constitution Act 1986". New Zealand Parliamentary Counsel Office. 1 January 1987. Retrieved 22 October 2018. ^ a b Quentin-Baxter & McLean 2017, pp. 178. ^ a b Eichbaum, Chris (20 June 2012). "Cabinet government – What is cabinet?". Te Ara: The Encyclopedia of New Zealand. Retrieved 1 July 2017. ^ "Our system of government". New Zealand Parliament. Retrieved 30 June 2017. ^ McLean, Gavin (13 December 2016). "Premiers and prime ministers". Te Ara: The Encyclopedia of New Zealand. Retrieved 30 June 2017. ^ a b "Modern duties". Ministry for Culture and Heritage. 14 June 2014. Retrieved 1 July 2017. ^ a b "Executive Council – Cabinet Manual". Department of the Prime Minister and Cabinet. Retrieved 1 September 2016. ^ "Seal of New Zealand Act 1977". ^ "Roles and regalia at the Opening of Parliament". New Zealand Parliament. 13 October 2014. Retrieved 24 October 2018. ^ Clerk of the House of Representatives (23 August 2017). "Writ-ten in the stars". New Zealand Parliament. Retrieved 11 November 2018. ^ Brasher, Norman Henry (1971). Studies in British Government. Springer. p. 13. ISBN 9781349154500. Retrieved 14 May 2018. ^ Memorandum on Interview with Sir Robert Stout, 10 July 2013: ANZ R19162235. ^ a b Palmer, Geoffrey; Palmer, Matthew (2004). Bridled Power: New Zealand's Constitution and Government (Fourth ed.). Oxford University Press. ISBN 0-19-558463-5. ^ a b Cartwright, Silvia (23 June 2006). "Modern aspects of the role of the Governor‑General of New Zealand". Governor-general of New Zealand. Retrieved 13 August 2007. ^ Keith, Kenneth (2008). "On the Constitution of New Zealand: An Introduction to the Foundations of the Current Form of Government". Retrieved 12 September 2011. ^ "The Reserve Powers". Governor-General of New Zealand. Retrieved 1 July 2017. ^ Joseph 2014, pp. 570–571. ^ "The Executive and the Whitlam Dismissal". Northern Territory University. Retrieved 22 May 2009. ^ "The Royal Prerogative of Mercy". Governor-General of New Zealand. Retrieved 1 July 2017. ^ "A timeline of David Bain's case". Radio New Zealand. 2 August 2016. Retrieved 1 July 2017. ^ Yang, Unity Elias (2014). Last Great Queen? : Elizabeth II, Mother of leadership, Seen from the crowd. AuthorHouse. p. 189. ISBN 9781491895160. ^ Quentin-Baxter & McLean 2017, pp. 282–285. ^ McLean 2006, pp. 16–17. ^ "Review of Defence Force Standards of Behaviour". State Services Commission. 16 July 2002. Retrieved 13 July 2007. ^ "The Governor-General's role as Commander-in-Chief". Governor-General of New Zealand. 10 December 2008. Retrieved 24 October 2016. ^ a b c McLean, Gavin (28 September 2016). "Governors and governors-general – Community duties". Te Ara: The Encyclopedia of New Zealand. Retrieved 29 June 2017. ^ a b "Current Vice-regal patronages". Governor-General of New Zealand. Retrieved 29 June 2017. ^ "Sir Keith Holyoake". Ministry for Culture and Heritage. 15 July 2014. Retrieved 5 November 2018. Last century most Governors-General were Freemasons, and they included visits to lodges in their tours of the country. ^ "The governance structure of St John". St John New Zealand. Retrieved 5 November 2018. ^ "Overview of The New Zealand Royal Honours System". www.dpmc.govt.nz/honours. Department of the Prime Minister and Cabinet. Retrieved 27 March 2013. ^ "Governor-General issues New Year message for 2009". Governor-General of New Zealand. 2 January 2009. Retrieved 2 January 2009. ^ a b "The Governor-General's Rolls-Royce". NZHistory. Ministry for Culture and Heritage. Retrieved 21 September 2010. ^ "Cost of the Monarchy". Monarchy New Zealand. 2009. Archived from the original on 5 February 2013. Retrieved 2 October 2010. ^ "Vote Prime Minister and Cabinet" (PDF). New Zealand Treasury. May 2010. pp. 269–270. Archived from the original (PDF) on 26 May 2010. Retrieved 2 October 2010. ^ "Monarchy New Zealand Calls for the Resignation of Republican Chair" (PDF). 28 October 2010. Archived from the original (PDF) on 22 July 2011. Retrieved 15 November 2010. ^ "Civil List Act 1979". Knowledge Basket. Retrieved 8 August 2007. ^ "Governor-General Act 2010 No 122 (as at 01 March 2017), Public Act". New Zealand Legislation. Retrieved 30 June 2017. ^ Duff, Michelle. "Government House". Governor-General of New Zealand. Retrieved 30 June 2017. ^ "Government Houses $44m facelift". 28 March 2011. Retrieved 18 April 2011. ^ "Speech at the opening of the Government House Visitor Centre, Wellington". Government House, Wellington: Governor-General of New Zealand. 14 November 2012. Retrieved 30 June 2017. ^ McLean, Gavin (28 September 2016). "Governors and governors-general – Vice-regal support". Te Ara: The Encyclopedia of New Zealand. Retrieved 24 October 2018. ^ "Who we are". Department of the Prime Minister and Cabinet. Retrieved 24 October 2018. ^ "The Governor-General on the move". NZHistory. Ministry for Culture and Heritage. 2 September 2016. Retrieved 9 November 2018. ^ "Jaguar sale". Government House. 16 August 2011. Retrieved 9 November 2018. ^ a b "New flag for Governor-General". Beehive.govt.nz (Press release). New Zealand Government. 3 June 2008. Retrieved 24 October 2018. ^ "The Governor-General's flag". Governor-General of New Zealand. Retrieved 30 June 2017. ^ "Other flags". Ministry for Culture and Heritage. Retrieved 24 October 2018. ^ "Half-masting the New Zealand Flag". Ministry for Culture and Heritage. 30 November 2017. Retrieved 24 October 2018. ^ "Instructions for Playing the Anthem", Encyclopaedia of New Zealand, Ministry for Culture and Heritage, 1966, If the first six bars only are used, as for a salute to the governor-general as the Queen's representative, the anthem is to be played "fortissimo" at M.M. 60 crotchets. ^ "2015 Order of Precedence in New Zealand" (PDF). Governor-general of New Zealand. Archived from the original (PDF) on 4 March 2016. Retrieved 30 June 2017. ^ Clark, Helen (17 July 2006). "Changes to rules around use of title". The Department of the Prime Minister and Cabinet of New Zealand. Archived from the original on 27 September 2007. Retrieved 21 August 2007. ^ Trendell, Hebert A. P. (1912). Dress worn at His Majesty's court: issued with the authority of the Lord Chamberlain. London: Harrison and Sons. pp. 49, 50. Retrieved 28 October 2018. ^ a b c Cox 2001, p. 20. ^ King, Michael (2003). The Penguin History of New Zealand. Penguin. ^ McLean 2006, p. 50. ^ a b McLean 2006. ^ Sinclair, Keith (7 April 2006). "Dictionary of New Zealand Biography George Grey 1812 – 1898". Retrieved 3 July 2007. ^ McLean 2006, p. 115. ^ McLean 2006, pp. 102–104. ^ Joseph 2014, pp. 155–157. ^ "Second Earl of Liverpool". Ministry for Culture and Heritage. Retrieved 22 October 2018. ^ McIntyre, W. David (20 June 2012). "Self-government and independence – Towards a republic?". Te Ara: The Encyclopedia of New Zealand. Retrieved 22 October 2018. ^ Joseph 2014, pp. 140–141. ^ a b McLean, Gavin (20 June 2012). "Governors and governors-general – Changing characteristics". Te Ara: The Encyclopedia of New Zealand. Retrieved 22 October 2018. ^ Joseph 2014, p. 154. ^ Joseph 2014, p. 162. ^ "Sir Paul Reeves". Ministry for Culture and Heritage. Retrieved 25 October 2018. ^ "The Hon Dame Catherine Tizard, GCMG, GCVO, DBE, QSO". Governor-General of New Zealand. Retrieved 23 October 2018. ^ Leckie, Jacqueline. "Anand Satyanand: A prominent son of the Indian diaspora" (PDF). New Zealand Journal of Asian Studies. 16 (2): 31–46. Retrieved 25 October 2018. ^ Satyanand, Anand (18 February 2009). Speech to Australasian Network of Pastoral Planners (Speech). Wellington: Government House. Retrieved 26 October 2018. Much was made of the fact that I was New Zealand's first Governor-General of Asian descent. But there was almost no comment at all on my being New Zealand's first Governor-General who was also a Catholic. ^ "Governor-General visits Belgium for Passchendaele Commemoration". Government House. 6 July 2007. ^ Associated Press (11 July 2007). "Queen Elizabeth II, Belgian royals pay tribute to allied soldiers of Passchendaele battle". International Herald Tribune. Archived from the original on 20 February 2008. ^ NZPA (15 August 2002). "Clark foresees president role". New Zealand Herald. Retrieved 23 July 2007. ^ Cox, Noel (2002). "The Effect of the Advent of the Mixed-Member Proportional Voting System Upon the Role of the Governor-General of New Zealand". University of Auckland. p. 434. Retrieved 27 October 2016. ^ Bolger, Jim (March 1994). Address-In-Reply debate, state opening of Parliament. ^ "Review of the Civil List Act 1979: Law Comm Report". New Zealand Law Commission. 17 December 2009. Retrieved 18 December 2009. ^ "Parliament of New Zealand – Order Paper" (PDF). Parliament of New Zealand. 30 June 2010. Cox, Noel (2001). "The Evolution of the Office of Governor-General of New Zealand" (PDF). Mountbatten Journal of Legal Studies. 5 (1–2). doi:10.2139/ssrn.420740. Retrieved 30 June 2017. McLean, Gavin (2006). The Governors: New Zealand's Governors and Governors-General. Dunedin: Otago University Press. ISBN 1-877372-25-0. Joseph, Philip A (2014). Constitutional and Administrative Law in New Zealand. Wellington: Brookers. ISBN 978-0-864-72843-2. Quentin-Baxter, Alison; McLean, Janet (2017). This Realm of New Zealand: The Sovereign, the Governor-General, the Crown. Auckland: Auckland University Press. ISBN 978-1-869-40875-6. Wikimedia Commons has media related to Governors-General of New Zealand.